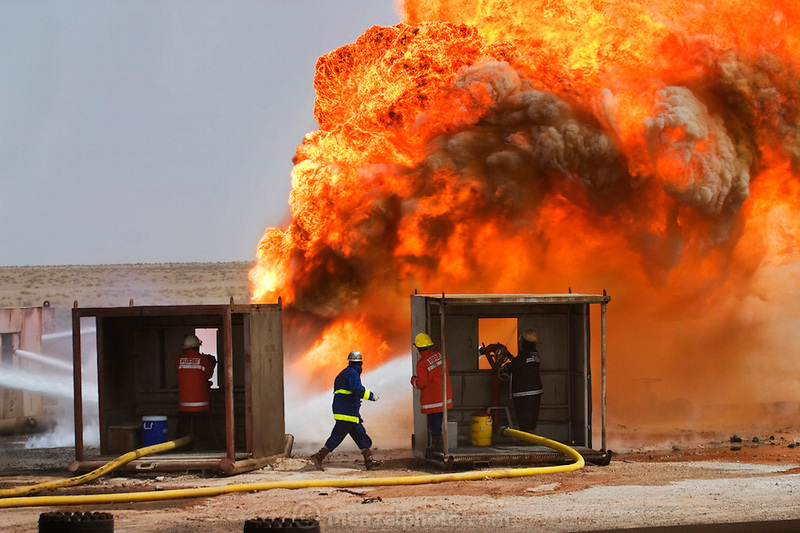 Firefighters from the KWWK (Kuwait Wild Well Killers) attempt to kill an oil well fire in the Rumaila field by dousing it with high pressure water hoses. Then they will guide a "stinger" that will pump drilling mud into the damaged well. A "stinger" is a tapered pipe on the end of a long steel boom controlled by a bulldozer. Drilling mud, under high pressure, is pumped through the stinger into the well, stopping the flow of oil and gas. A wind shift after a sandstorm covered many of the men and machines in oil, a dangerous shift. The Rumaila field is one of Iraq's biggest oil fields with five billion barrels in reserve. Rumaila, Iraq. Rumaila is also spelled Rumeilah.